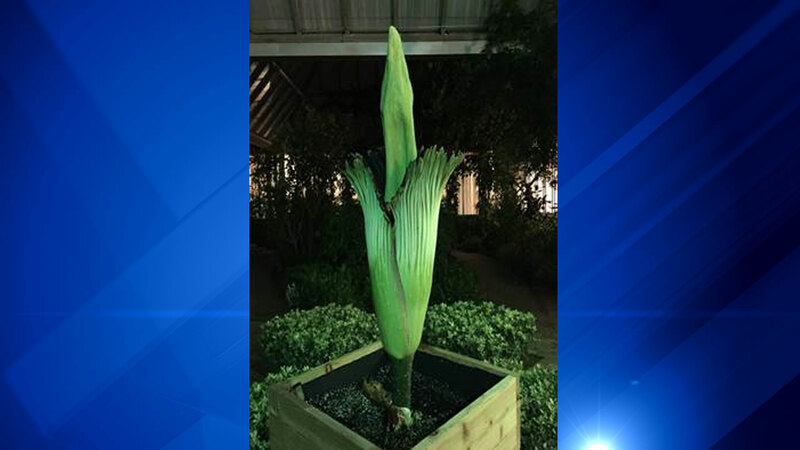 GLENCOE, Ill. -- Alice, one of the Chicago Botanic Gardens' eight titan arums or corpse flowers, bloomed overnight and is available for the public to see and smell. The garden announced the flower is not only on display, but blooming, on Tuesday morning. Spike, another one of the botanic garden's corpse flowers, failed to bloom in August, disappointing anxious visitors hoping to take in its stench. The corpse flower emits an unusually bad stench often compared to the scent of rotting bodies, hence its nickname. That odor, described by the garden as a "combination of limburger cheese, garlic, rotting fish and smelly feet," will only last for the next 24-36 hours. The Chicago Botanic Garden will be open from 8 a.m. to 2 a.m. on Tuesday, Sept. 29, and from 8 a.m. to 7 p.m. Wednesday, Sept. 30. The flower's stench is strongest in the early morning hours. Alice is on display in the semi-tropical greenhouse at the Regenstein Center.